"I had the opportunity to spend 14 months on an extended internship with Oshkosh Corporation in Oshkosh, Wisconsin. People first asked me how I would use my Materials Science and Engineering background to make Oshkosh B’Gosh overalls, but they were sorely mistaken. 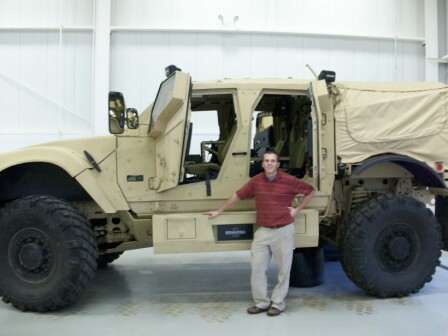 Oshkosh Corporation designs and builds the world’s toughest specialty trucks for military, fire and emergency, concrete placement, refuse hauling, access/construction equipment, and snow removal markets. I worked in the Materials and Process Engineering group which served the entire corporation, thus allowing me to work on different projects daily. Typical projects included performing failure analysis, corrosion testing, reverse engineering, material evaluation and new product development. For a few months, I had a hand in the development and testing of transparent and vehicle armor packages. I was also in charge of keeping the lab maintained and organized because new projects arrived daily from all the different segments of the company. A few projects required me to travel to other cities and states, as well as other manufacturing facilities. I am a very hands-on type of person, so it was great not to be stuck behind a desk all day. I was very blessed to have such an invaluable experience at this co-op and I was also featured on the college relations website for the company in ‘a day in the life’ category. This co-op had the coolest projects with the majority of them being high priority, confidential, and proprietary projects for the government. In addition, it was gratifying to go to work every day knowing that ultimately, those trucks will roll off the line to help save lives." "Meaning is not what you start with, but what you end up with."